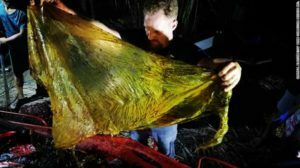 Philippines: A whale died of starvation and dehydration after it consumed 88 pounds of plastic bags. Scientists found 40 kilograms of plastic inside its stomach. Darell Blatchley a Marine Biologist said that the whale showed signs of being dehydrated, the whale also vomited blood before it died. Darell Blatchley is the president and founder of the D’ Bone Collector Museum, the museum is located in Davao City, Philippines. Darell said that they received a call that a whale was found in Mabini, a city in the Compostela Valley. The team of Darell took the body of the whale to its facility and did a necropsy to it, after performing the necropsy they found out that the whale died from ingesting plastic. Darell said that they found 40 kilos of sacks, banana plantation bags, normal plastic bags, and grocery bags inside the stomach of the whale. Darell added that the plastic bags inside the stomach of the whale had started to calcify. Darell said that cetaceans, a family of aquatic mammals like dolphins and whales do not drink water from the ocean, but, they actually get it from the food that they consume. As the whale had ingested a lot of plastic, it could not eat any food. So, therefore, the whale died of starvation and dehydration. Darell said that their team has done necropsies on 61 whales and dolphins in the past 10 years and 57 of them died due to the accumulated plastic inside their stomachs. Darell added that this is the biggest amount of plastic that they have ever seen inside a whale. 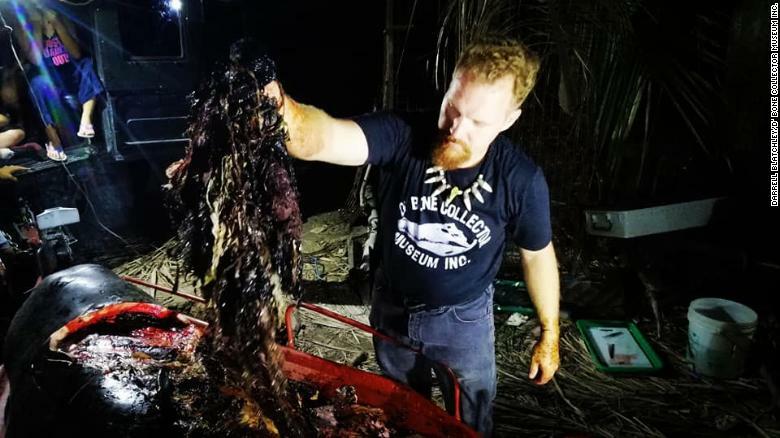 A statement was released by the D’ Bone Collector Museum, and they said that this is the first time their team has seen this amount of plastic inside a stomach of a whale, they called the incident as “It’s very disgusting and heartbreaking”. The staff of the D’ Bone Collector Museum is asking the government to take serious actions against those people who are still throwing plastic bags and trash in the ocean. The government of the Philippines has strict rules and regulations on garbage disposals, but the rules are not implemented properly.